Dr. Jeanie McHugo is an Associate Professor and Chair in the Department of Physician Assistant (PA) Studies. Dr. McHugo has been a Physician Assistant for more than 20 years and formally involved in PA Education for more than 15 years. Her educational focus began as a preceptor, subsequent academic and clinical faculty, and currently Department Chair. Her clinical experience includes urgent care/family medicine, general medicine with psychiatric emphasis, and clinical and surgical orthopedics. 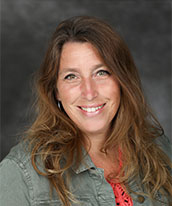 A graduate of Mankato State University, the University of South Dakota and the University of Nebraska-Omaha, Dr. McHugo completed her doctorate degree in Higher Education: Teaching and Learning at the University of North Dakota with a dissertation titled An Evaluation of the Clinical Teaching Process: Perspectives from the University of North Dakota Physician Assistant Program. She has been involved in PA admissions and curriculum at the national level with the Physician Assistant Education Association (PAEA). In addition, she is an accreditation site visitor and Commissioner for the Accreditation Review Commission for the Education of Physician Assistants (ARC-PA). Her research interest areas include clinical teaching evaluation and improvement, student and program assessment, teaching and learning strategy and andragogical learning theory.